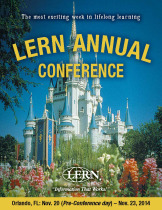 LERN Annual Conference Attendees Can Receive College Credit! LERN Annual Conference attendees can now receive undergraduate or graduate credit for their attendance at the c onference, Nov. 20-23 in Orlando, Florida, through the University of South Dakota. In order to receive the 1.0 credit, participants must register for the LERN Annual Conference as well as directly through USD. Tuition for the credit is paid directly to USD – and the LERN Conference fee is separate. Click here to register for the LERN Conference. If you are not already a USD student, to receive credit, you first fill out this online registration form. Current USD students can use WebAdvisor. The course prefix is: AHED 790. The course title is: Strategies for Lifelong Learning. The cost is $40. How will this promote 21st century learning? For more information, call (800) 678-5376 – or email LERN at info@lern.org.